Weird flex but we like it. We know, when you think hockey, you don’t think Ariana Grande. The pop sensation holds a pretty hilarious, albeit painful, hockey record, and honestly, we’re pretty impressed by the coincidence. The ‘God is a Woman’ singer was apparently a huge Panthers fan as a kid, and and attended every single Florida Panthers home game starting when she was just two years old. Apparently, though, she’s a hockey fan with some odd luck. The star was hit by not one, but TWO pucks at Panthers games on separate occasions before she was six years old. Moreover, she was the first person to be hit by a puck in the Panthers’ new rink. Not to worry, though, as her mom chimed in and let the Twitterverse know that she took the rubber like a champ. how cute is she??? this was the second time she got hit actually, right before the zamboni ride... but she was amazingly brave even then and wouldn't miss the ride.... proud of her then and now.. and honestly I still have that article on my refrigerator at my office..
Grande’s first ever TV performance was actually singing the anthem at Panthers game when she was eight years old, and she’s been a loyal fan for a long time. We’re not sure if we should call it bad luck, and we’d go so far as to say that this kind of crazy coincidence might actually be good luck. 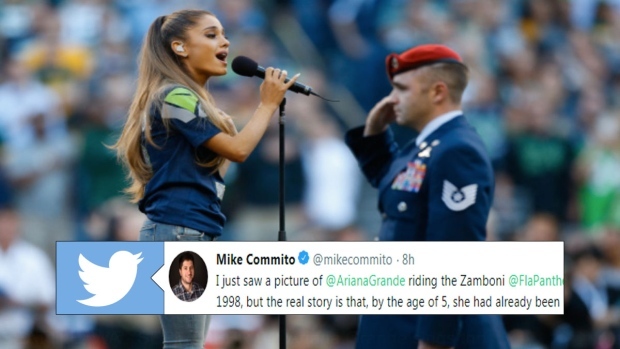 Either way, things have turned out pretty well for Ariana.